Student technology trainers celebrate a great year! 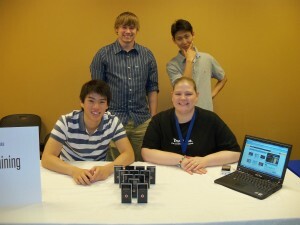 April 26, 2012 / 2 Comments on Student technology trainers celebrate a great year! 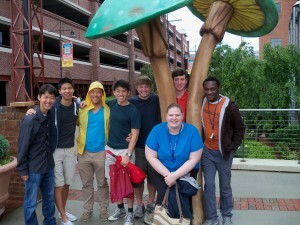 OIT Student Technology Trainers with Christine Vucinich at the American Tobacco Campus. Today, Christine Vucinich (OIT Training Coordinator) and the OIT student technology trainers (Tim Yoon, Kevin Hu, Alex Dou, Boris Lau, Ryan Lipes, Patrick Royal and Dagbedji Fagnisse as seen l-r in photo above) celebrated the end of the academic year at the American Tobacco Campus. Congratulations to all the students on a great year and especially our three graduating seniors – Boris Lau, Ryan Lipes and Tim Yoon! We’ll miss you guys! Seniors Boris Lau, Ryan Lipes & Tim Yoon with Christine Vucinich during a Technology @ Duke Blue Devil Days session (spring 2011). The Office of Information Technology is hiring student staff for the Technology Training Program for Fall 2012! 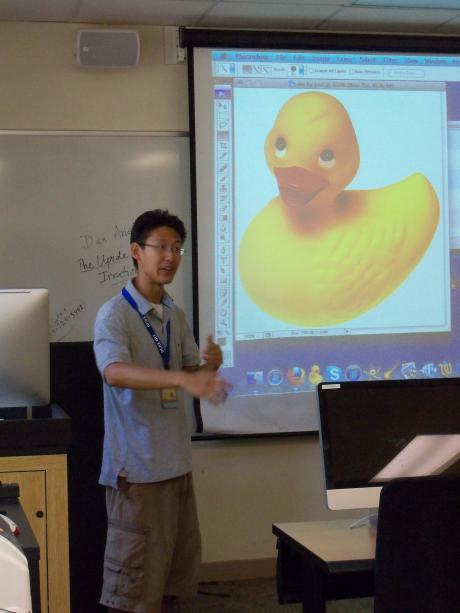 Student Trainer, Tim Yoon, teaching a Photoshop seminar.